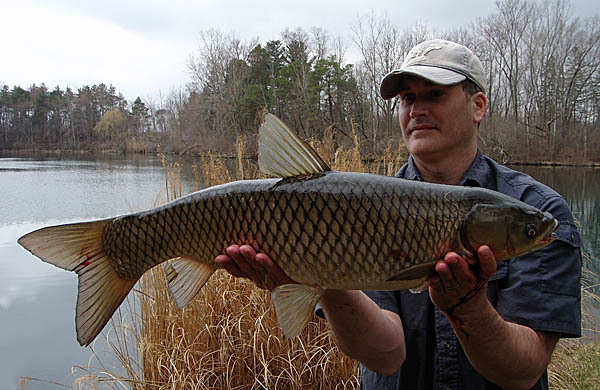 Grass Carp added to life list! As a multi species angler, adding a species to my life list always ranks at the top of my fishing goals. Add a lifer that comes with a great story and family around to witness it, and it makes it’s way into some of my all time favorite catches. Being Easter Sunday, the family headed to Jill’s aunt & uncle’s home that sits on a very magnificent fishing lake. I have caught numerous Largemouth Bass, some real monster Bluegill and a couple Bullhead in. The fishing plan was very simple for the day, catch some fish on the spinning gear and then discipline myself to practice with the fly rod. Everything went as planned. I caught quite a few Largemouth Bass on a jig/grub combo and then some on the 4wt fly rod. I managed a couple real nice Bluegill, the largest being a bit over 10″. The day was complete with a Fish Ohio award sized Bluegill and catching fish on the fly rod, if it would have ended then, I was more than satisfied. As fate would have it, I got a massive knot on the end of my fly line. Knowing it would take quite awhile to get it untangled, I decided to throw out an offering that I could still-fish while working on the mess. After tying on a tandem of 1/64 oz jigs, I went to the container of waxworms. The waxworms looked like they were on steroids and then I read the container to see that it said “Butter Worms”. My wife had been kind enough to offer to get my bait while she was out shopping, and inadvertently grabbed these. It goes without saying that his proved to be a very fortunate mistake! I had barely made progress on my knot when I saw my bobber go under. I ran to my rod and knew instantly it wasn’t anything I had encountered on this body of water before. The fish was powerful, and nearly impossible to control on the 6# line. I was trying to play the fish while waving frantically at everyone in the house. I didn’t have a net but thought Jill’s uncle might have one, or if nothing else, people might get to see a glimpse of the fish before it broke me off. Surprisingly, as many runs as the fish made, it stayed on. I got it into the shallow water by the dock several times, with it slipping out of my hands and back into the water. On the third or fourth attempt, I was able to get my fingers behind the gills to hoist it onto the shore. At some point people must have seen or heard me as by the time it was successfully landed – everyone was standing there watching. Jill grabbed the camera and took some really great shots rather quickly, and the fish was returned to the water without issue. I really feel lucky to have caught and landed this fish, what a memory! While the Grass Carp stole the show, a 10.25″ “Fish Ohio Award” Bluegill and fly caught Largemouth Bass highlighted some of the other catches from the day. I can’t wait to get back to this lake.